Create your own bookmarks! Assorted primary color bookmars 2" wide x 6.5" long with a hole punch for ribbons are ready for kids' creativity. Decorate and embellish with stickers, markers, jewel pieces, or anything you can think of. Acid free. 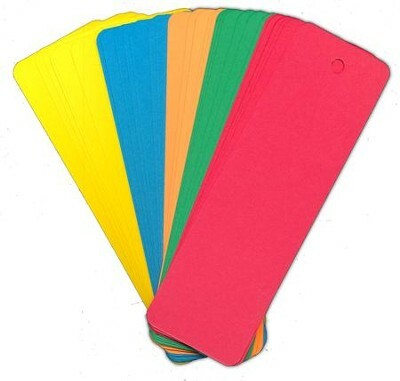 Five colors (red, green, orange, blue and yellow) x 6 of each color, for 35 bookmarks per pack. I'm the author/artist and I want to review Blank Bookmarks Primary Assorted.